Designed to make a big statement in garages, workshops, mudrooms and other areas of your home, the Bold 3.0 Series cabinet system instantly upgrades the look of your space, providing you with organized storage for all your belongings.Built with heavy-duty 24-gauge steel for added strength, these cabinets are ready to hold everything from sports equipment to gardening tools, and the scratch and stain resistant powder-coat paint finish protects the cabinets from everyday heavy use.Full-length integrated handles allow you to quickly and easily access your gear, and adjustable steel shelves give you the flexibility to store items of all sizes, while fully-lockable doors ensure that your tools stay safe.Get organized, and simplify your life, with Bold 3.0 Series Garage Cabinets. 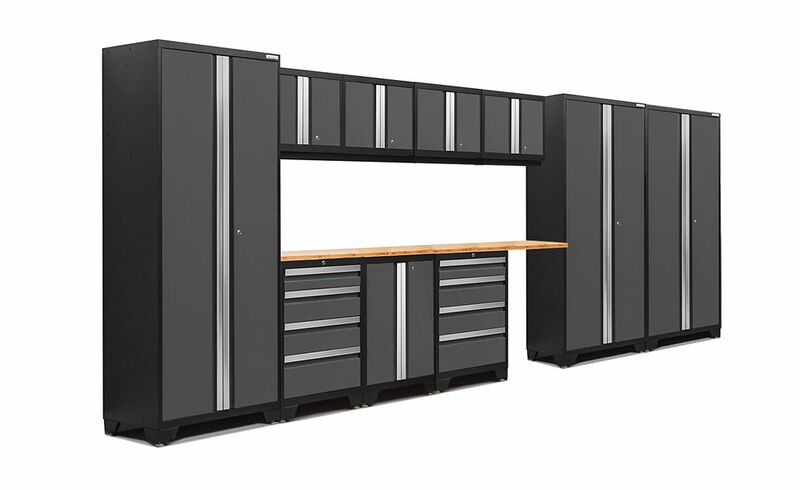 Bold 3.0 Storage Cabinets in Grey (12-Piece Set) Designed to make a big statement in garages, workshops, mudrooms and other areas of your home, the Bold 3.0 Series cabinet system instantly upgrades the look of your space, providing you with organized storage for all your belongings.Built with heavy-duty 24-gauge steel for added strength, these cabinets are ready to hold everything from sports equipment to gardening tools, and the scratch and stain resistant powder-coat paint finish protects the cabinets from everyday heavy use.Full-length integrated handles allow you to quickly and easily access your gear, and adjustable steel shelves give you the flexibility to store items of all sizes, while fully-lockable doors ensure that your tools stay safe.Get organized, and simplify your life, with Bold 3.0 Series Garage Cabinets. Bold 3.0 Storage Cabinets in Grey (12-Piece Set) is rated 5.0 out of 5 by 1.